The kids clamored for pancakes and this momma came through with a blueberry indulgence that hit the spot. I mention indulgence because I don’t typically add ricotta cheese to our pancakes, but wow, such glorious addition to this brunch of ours. I had purchased two containers of Ricotta Cheese marked down and Crepes were on my mind when I bought them. Instead of spending the extra time making crepes, I decided to go for the same creamy taste, but added the ricotta right into the pancakes. Light, airy, creamy, and melt in your mouth goodness they were. I love when blueberries are in season because I add them to everything. 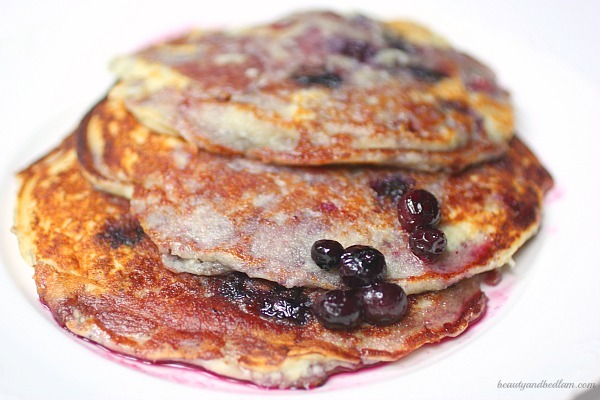 Summary: These delicious Blueberry Ricotta Pancakes make the perfect breakfast treat. In a mixing bowl combine flour, baking powder, and salt. In another mixing bowl beat together ricotta cheese, egg yolks, and sugar until well combined. Add to flour mixture; stir until smooth. Stir in milk. Fold in blueberries. In a small mixing bowl, beat the egg whites with an electric mixer on high speed until stiff peaks form (tips stand straight). Gently fold the beaten egg whites into batter, leaving a few puffs of egg white. Do not overbeat. On a lightly greased griddle, pour about 1/4 cup batter onto the hot griddle. Cook over medium heat until pancakes are golden brown, turning to cook the second sides when pancake surfaces are bubbly and edges are slightly dry (about 1 to 2 minutes per side). Serve immediately or keep warm in a loosely covered ovenproof dish in a 300 degree F oven. 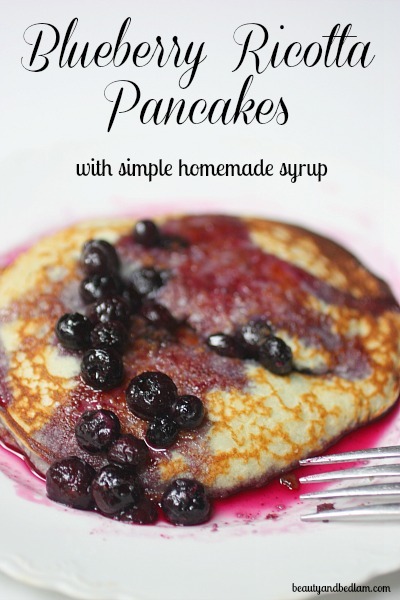 If desired, serve with Homemade Blueberry Syrup. Years ago, I saw this BHG original recipe, but since then I’ve played with it quite a bit. Often I don’t want to take the time to whip the egg whites, so I will just mix in regular eggs. Also, instead of doubling the milk to 1/2 cup, I will use half orange juice and half milk for a citrusy punch. It’s delicious. Enjoy! What are you serving up for Tasty Tuesday? I can’t wait to see all the yumminess you are sharing. @April @ The 21st Century Housewife, That triple ginger pound cake sounds heavenly. Can’t wait to check it out, April. 🙂 Thanks for sharing. WOW, I’d say. That is amazing. Tell her, great job! !